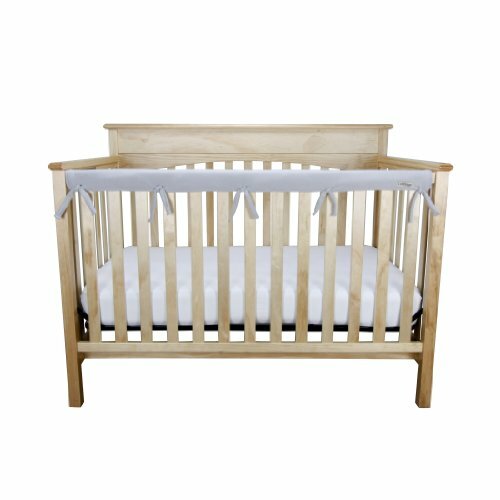 American Baby Company's Rail Cover for narrow crib rails is the perfect solution for protecting your crib and teething baby. With super soft chenille on the top, a light padding in the middle and reversible chenille backing, you no longer have to worry about your baby ingesting wood or harmful toxins. Long rail cover measures 51" x 7" with ties. Also available in 2 piece set for side rails. Fits crib rails measuring up to 8" around. Machine wash cold with gentle cycle. Protect your baby and protect your crib. Trend Lab's CribWrap Rail Cover for narrow rails is the perfect solution for protecting your crib and teething baby. With super soft gray Sherpa fleece on the top, a light padding in the middle and a waterproof backing, you no longer have to worry about your baby ingesting wood or harmful toxins. Just wrap and tie on this simple solution to protect your crib rails from teeth marks and drool discoloration, and to preserve your crib investment for years to come. Short rail covers each measure 51" x 6" with 6.5" ties. Also available in two piece set for side rails. Fits crib rails measuring up to 8" around. CribWrap Rail Covers are PVC, BPA, lead and phthalate free. Trend Lab Waterproof CribWrap Rail Cover - For Narrow Side Crib Rails Made to Fit Rails up to 8" Around. Pack of 2! Protect your baby and protect your crib. Trend Lab's CribWrap Rail Cover for narrow rails is the perfect solution for protecting your crib and teething baby. With super soft gray Sherpa fleece on the top, a light padding in the middle and a waterproof backing, you no longer have to worry about your baby ingesting wood or harmful toxins. 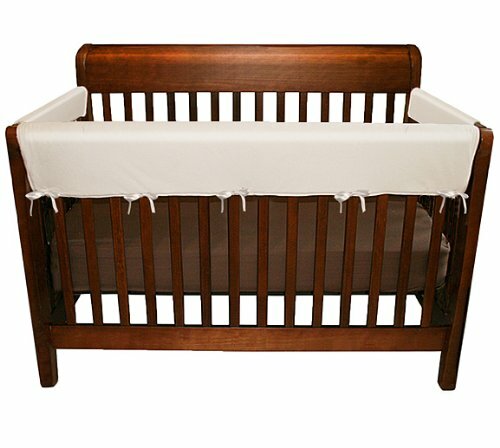 Just wrap and tie on this simple solution to protect your crib rails from teeth marks and drool discoloration, and to preserve your crib investment for years to come. Short rail covers each measure 27" x 6" with 6.5" ties. Also available in one long rail piece. 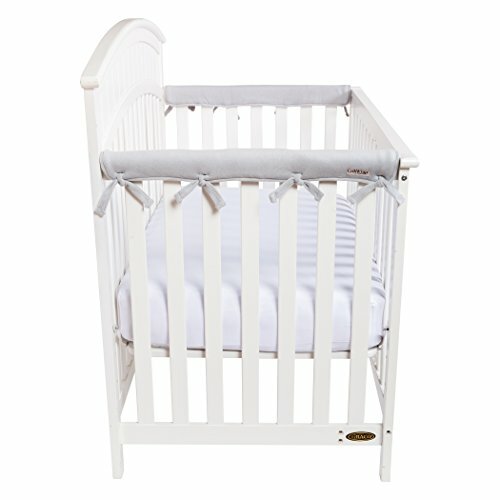 Fits crib rails measuring up to 8" around. CribWrap Rail Covers are PVC, BPA, lead and phthalate free. Protect your baby and protect your crib! Trend Lab's CribWrap Rail Cover for wide rails is the perfect solution for protecting your crib and teething baby. With super soft white Sherpa fleece on the top, a light padding in the middle and a waterproof backing, you no longer have to worry about your baby ingesting wood or harmful toxins. Just wrap and tie on this simple solution to protect your crib rails from teeth marks and drool discoloration, and to preserve your crib investment for years to come. Long rail cover measures 51 in x 18 in with 6.5 inch ties. Also available in 2 piece set for side rails. Fits crib rails measuring 8 in - 18 in around. CribWrap Rail Covers are PVC, lead and phthalate free. The 3 piece Soft Rail for Convertible Cribs provides 3 side protections for baby from chewing crib rails while teething and the crib from teething marks and scratches. 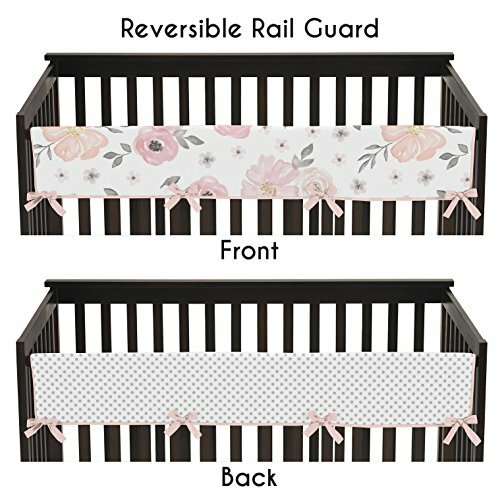 The Sweet Jojo Designs Rail Guard Crib Covers are the best solution to combine safety and style. Now you can protect your baby from wood splinters and paint chemicals during the teething months, without giving up the look of your nursery. In addition, for those parents that choose not to use a bumper, you will now have a stylish safety solution for your room. Also available in a 2 piece short side rail set, to protect all the rails of your crib. Fits most standard cribs. Protect your baby and protect your crib. Trend lab's crib wrap rail cover for wide rails is the perfect solution for protecting your crib and teething baby. With super soft gray Sherpa fleece on the top, a light padding in the middle and a waterproof backing, you no longer have to worry about your baby ingesting wood or harmful toxins. 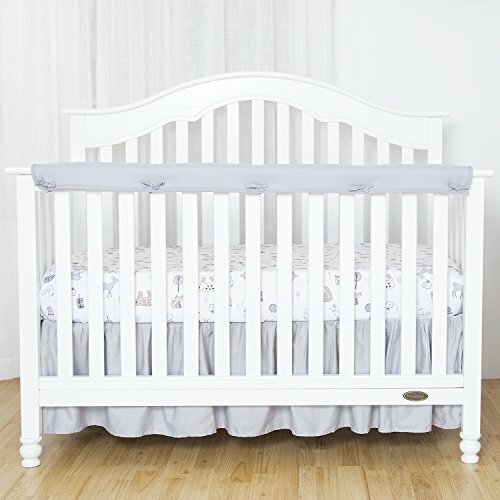 Just wrap and tie on this simple solution to protect your crib rails from teeth marks and drool discoloration, and to preserve your crib investment for years to come. Short rail covers each measure 27" x 18" with 6.5" ties. Also available in one long rail piece. Fits crib rails measuring 8" - 18" around. 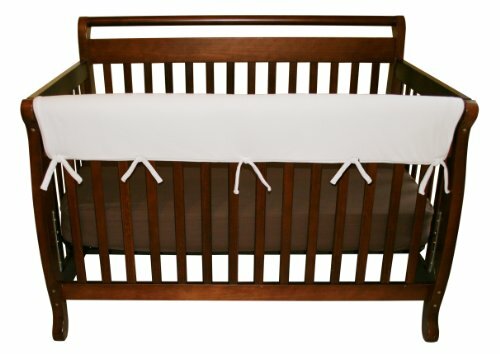 Crib wrap rail covers are PVC, BPA, lead and phthalate free. 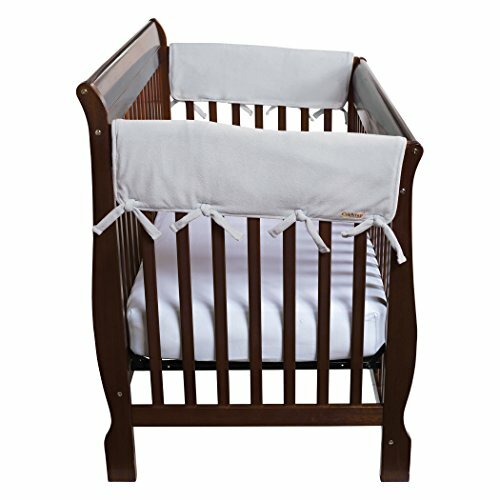 Shopping Results for "Front Crib Rail Cover"